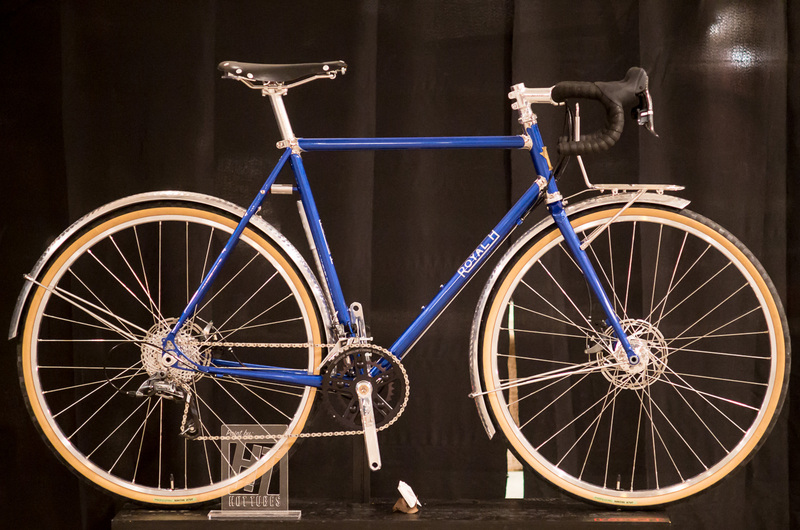 To conclude our three-part series of Beautiful Bikes from Boston's Builders' Ball, here is this drop-dead gorgeous, modern Randonneur built by Bryan Hollingsworth of Royal H Cycles. 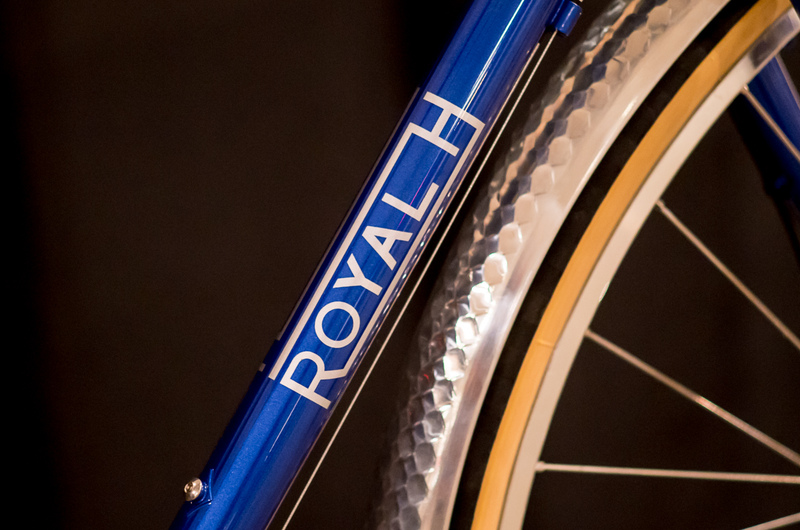 It has a ton of really neat features that incorporate new tech into a fairly traditional machine including disc brakes, thru-axles, threadless headset, and straight bladed fork with tapered legs. Here is a description of the bike from Bryan. Enjoy! 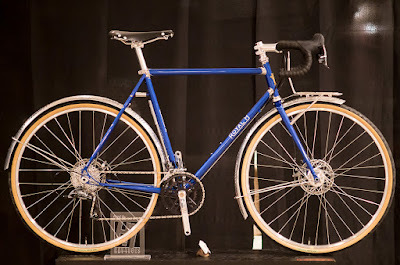 "The blue rando bike was built for a customer in New Jersey. I met up with them at my parents house in a freak early-Spring ice storm and had to do the complete fitting and bike discussion in the dark, as a tree took out the electricity to the house. It originally was supposed to have satin finished stainless lugs, but i got caught up in the polishing and took them to mirror finish. They match the luster of the White Industries headset, crank, and hubs, as well as the polished Velo Orange fenders and rack. 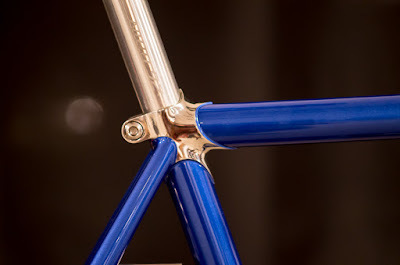 The lugs are hand cut - the pattern is simple, but I removed a lot of unnecessary material from the originals. 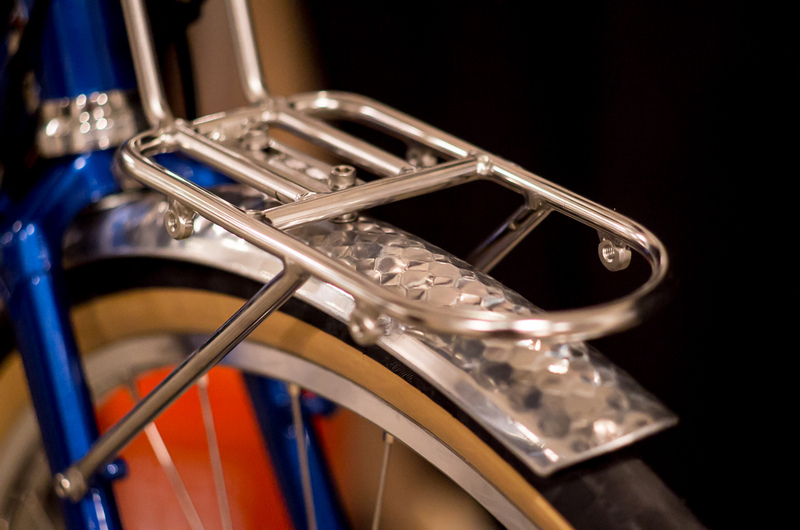 The bike is also built for disc brakes, which i think is a fun take on the traditional rando design. I suppose it's not a true rando, since it doesn't have an integrated lighting system, but the customer wanted to run a battery powered front light. I fabricated a stainless steel body for a handlebar plug battery light that mounts on a special braze on behind the seat tube for the rear. 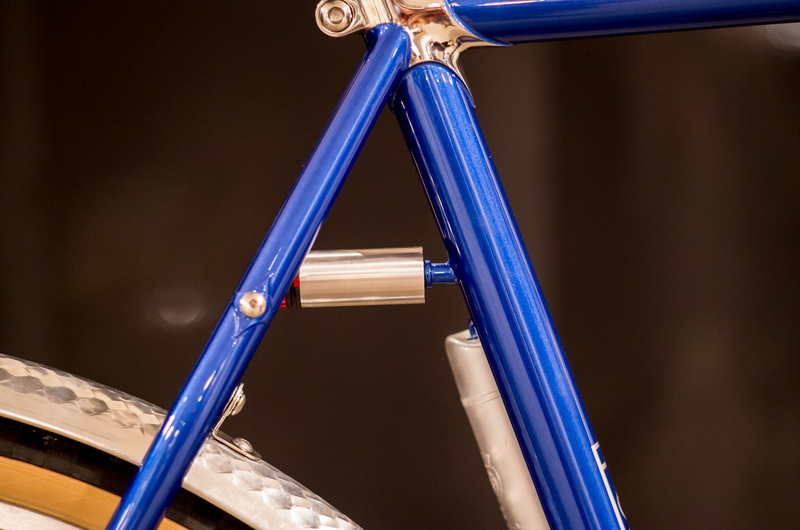 The silca frame pump also mounts behind the seat tube for a slightly different look. 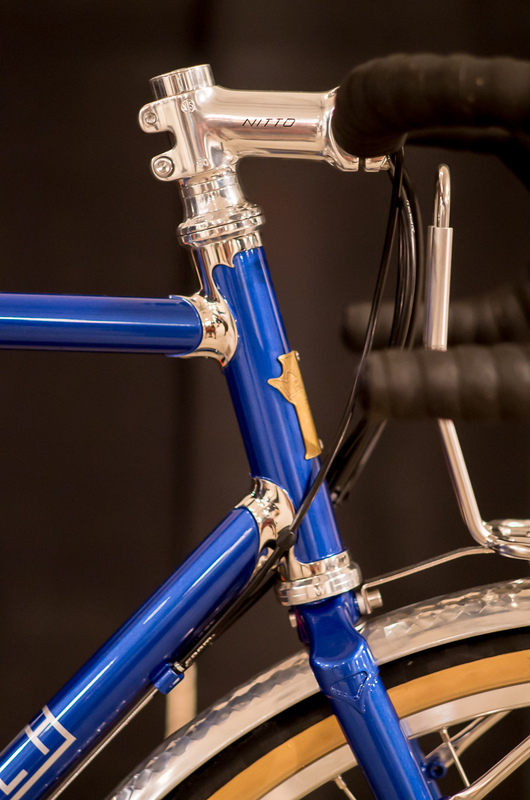 Aside from that, the bike was made to fit the customer, and be a comfortable distance machine. It's exactly my size, so i got to take it for a test ride, and it can move as well! I forgot to bring the Roadrunner X Velo Orange front bag to the show, but that's what is going to go on that rack. I love the integrated decaleur system!"